Haydee E. P. Bazan, Ph.D.
1965-1966 — Research Fellow, College of Physicians and Surgeons, Columbia University, New York. 1967-1968 — Research Assistant, Department of Biological Chemistry, Harvard University Medical School, Boston, MA. 1970-1977 — Instructor, Department of Biology, Universidad Nacional del Sur, Bahia Blanca, Argentina. 1977-1981 — Assistant Professor, Department of Natural Sciences, Universidad Nacional del Sur, Bahia Blanca, Argentina. 1981-1988 — Assistant Professor in Ophthalmology, Biochemistry and Molecular Biology, LSU Medical Center, School of Medicine, New Orleans. 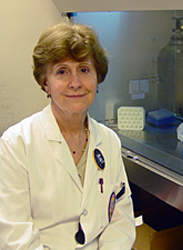 1988-1993 — Associate Professor, in Ophthalmology, Biochemistry and Molecular Biology, LSU Medical Center, School of Medicine, New Orleans. 1993-present — Professor, in Ophthalmology, Biochemistry and Molecular Biology and Neuroscience, LSU Medical Center, School of Medicine, New Orleans. Elected Board member, LSU Medical Center Sigma Xi, 1990-92. Role Model Young Leadership Council, New Orleans, 2003. Honorary Alumnus, LSU School of Medicine, 2008. Signal transduction mechanisms of lipids and growth factors involved in inflammation and repair during corneal wound healing. Mechanisms of neuroregeneration for the understanding and treatment of complications generated by nerve damage. NIH, National Eye Institute, Special Emphasis Panel, reviewer-2008. NIH, National Eye Institute, AED, reviewer-2010. Dr. Haydee E.P Bazan's laboratory studies lipid second messengers in the cornea, particularly platelet activating factor (PAF), a potent lipid mediator of inflammatory and immunological responses and lipoxygenease derivatives from the arachidonic cascade. The laboratory has demonstrated that PAF is generated in retina and cornea after injury (e.g., laser photocoagulation, chemical burns in the eye) and that PAF mediates its action through receptors. Dr. Bazan's laboratory has discovered that this particular lipid induces the expression of selective metalloproteinases (MMPs) – MMP-9, MMP-1 and MT1-MMP – involved in the degradation of components of the extracellular matrix (ECM) that are very important in the process of tissue repair. PAF also induces the expression of genes such as cyclooxygenase-2 (COX-2), increasing the synthesis of prostaglandins and producing sustained inflammation in the eye. On the other hand, 12/15 lipoxygenease derivatives are mediators in the repair action of EGF after corneal injury. Another research interest is the study of cell signal transduction events during corneal wound healing, particularly how specific growth factors (HGF, KGF and EGF) are released during injury activate kinases and phosphatases to communicate their signals from the cell membrane to the nuclei. A third project in the laboratory is the action of lipid mediators derived from docosahexaenoic acid (DHA) in combination with pigment epithelial derived growth factor (PEDF) on nerve regrowth after corneal wounding. Because corneal nerves are important in the maintenance of corneal integrity and prevention of dry eye following surgery, these studies are of clinical significance. Several animal models, as well as cells and organ cultures, are used. Analytical procedures such as liquid chromatography and mass spectrometry, a variety of molecular biology techniques such as real time PCR, siRNAs, Western blot, immunoprecipitations, kinase assays and immuno-fluorescence are employed. He J, Cosby R, Hill JM, Bazan HE. Changes in Corneal Innervation after HSV-1 Latency Established with Different Reactivation Phenotypes. .
Curr Eye Res. 2017 42(2):181-186. He J, Pham TL, Kakazu A, Bazan HEP. Recovery of Corneal Sensitivity and Increase in Nerve Density and Wound Healing in Diabetic Mice After PEDF Plus DHA Treatment. Diabetes. 2017. pii: db170249. doi: 10.2337/db17-0249. He J, Cosby R, Hill JM, Bazan HE. Changes in Corneal Innervation after HSV-1 Latency Established with Different Reactivation Phenotypes. He J, Bazan HE. Neuroanatomy and Neurochemistry of Mouse Cornea. Invest Ophthalmol Vis Sci. 2016 Feb;57(2):664-74. doi: 10.1167/iovs.15-18019. He J, Cortina MS, Kakazu A, Bazan HE.The PEDF Neuroprotective Domain Plus DHA Induces Corneal Nerve Regeneration After Experimental Surgery. Invest Ophthalmol Vis Sci. 2015 Jun;56(6):3505-13. doi: 10.1167/iovs.15-16755. Kenchegowda S, He J, Bazan HE., Involvement of pigment epithelium-derived factor, docosahexaenoic acid and neuroprotectin D1 in corneal inflammation and nerve integrity after refractive surgery.Prostaglandins Leukot Essent Fatty Acids. 2013 Jan;88(1):27-31. He J, Bazan HE., Corneal nerve architecture in a donor with unilateral epithelial basement membrane dystrophy., Ophthalmic Res. 2013;49(4):185-91. Cortina, M.S., Bazan, H.E.P. Docosahexaenoic acid, protectins and dry eye. Curr Opin Nutr Metab Care(2011) 14:132-137. He, J., Kakazu, A.H., Bazan, N.G., Bazan, H.E. Aspirin-triggered lipoxin A4 (15-epi-LXA4) increases the endothelial viability of human corneas storage in optisol-GS. J. Ocul Pharmacol Ther, (2011) 27:235-241. Kenchegowda, S., Bazan, N.G., Bazan, H.E. EGF stimulates lipoxin A4 synthesis and modulates repair in corneal epithelial cells through ERK and p38 activation. Invest Opthalmol Vis Sci. (2011) 6:52(5):2240-9.
improves tear production and decreases inflammation in a dry eye mouse model. J Ocul Pharmacol Ther(2010) 26:431-439. He, J., Eastlack, J.P., Bazan, H.E.P. The induction of an angiogenesis response in corneal myofibroblasts by platelet-activating factor, Curr. Eye Res, (2010) 35:1063-1071. Cortina, M.S., He, J., Li, N., Bazan, H.E.P. PEDF plus DHA induces neuroprotection D1 synthesis and corneal nerve regeneration after experimental surgery. Invest Opthalmol Vis Sci(2010) 51:804-810. Kakazu, A., Sharma, G., Bazan, H.E.P. Association of protein tyrosine phosphates (PTPs)-1B with c-Met receptor and modulation of corneal epithelial wound healing. Invest Ophthalmol Vis Sci (2008) 49:2936-45. He, J., Bazan, H.E.P. Epidermal growth factor (EGF) induces corneal keratocyte differentiation via PI-3 kinase activity. Synergism with TGF-β1. Invest Ophthalmol Vis Sci (2008) 49:2927-35. Sharma, G.D., Kakazu, A., Bazan, H.E.P. Protein kinase C alpha and epsilon differentially modulate hepatocyte growth factor-induced epithelial proliferation and migration. Exp Eye Res (2007) 85:289-97. Taheri, F., Bazan, H.E.P. Platelet-activating factor overturns the transcriptional repressor disposition of Sp1 in the expression of matrix metalloproteinase 9 in human corneal epithelial cells. Invest Ophthalmol Vis Sci (2007) 48:1931-41. He, J., Bazan, H.E.P. Synergistic effect of platelet-activating factor and tumor necrosis factor-alpha on corneal myofibroblast apoptosis. Invest Ophthalmol Vis Sci (2006) 47:883-91. He, J., Bazan, N.G., Bazan, H.E.P. Prevention of Alkali-induced corneal stromal melting by a novel platelet-activating factor receptor antagonist. Arch Ophthalmol (2006) 124:70-8. Esquenazi, S., Bazan, H.E.P., Bui, V., He, J., Kim, D., Bazan, N.G. Topical combination of NGF and DHA increases rabbit corneal nerve regeneration after PRK. Invest Ophthalmol Vis Sci (2005) 46:121-7. Bazan, H.E.P . Cellular and molecular events in corneal wound healing: Significance of lipid signaling. Exp Eye Res (2005) 80:453-63. "Lipid Mediators in Corneal Nerve Regeneration"
Principal Investigator: Haydee E. P. Bazan, Ph.D.